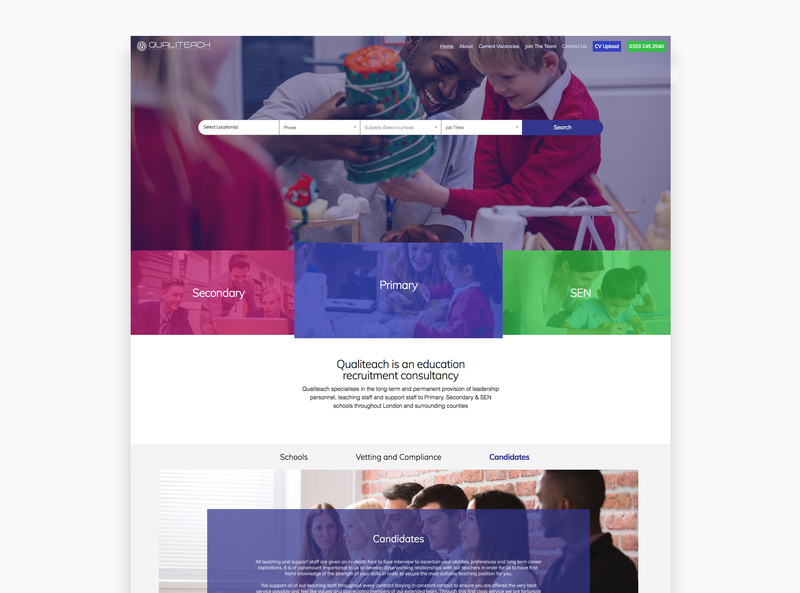 Qualiteach is an education recruitment consultancy that specialises in providing long-term recruitment solutions to schools throughout London and surrounding counties. Qualiteach approached Original People to re-develop their existing platform and produce a contemporary new one that would resonate with the innovative company that they are. The website needed to be designed with a host of audiences in mind, as the site needs to appeal to teachers from every schooling stage, schools wanting to partner with Qualiteach for resource allocation and recruitment consultants hoping to join Qualiteach. 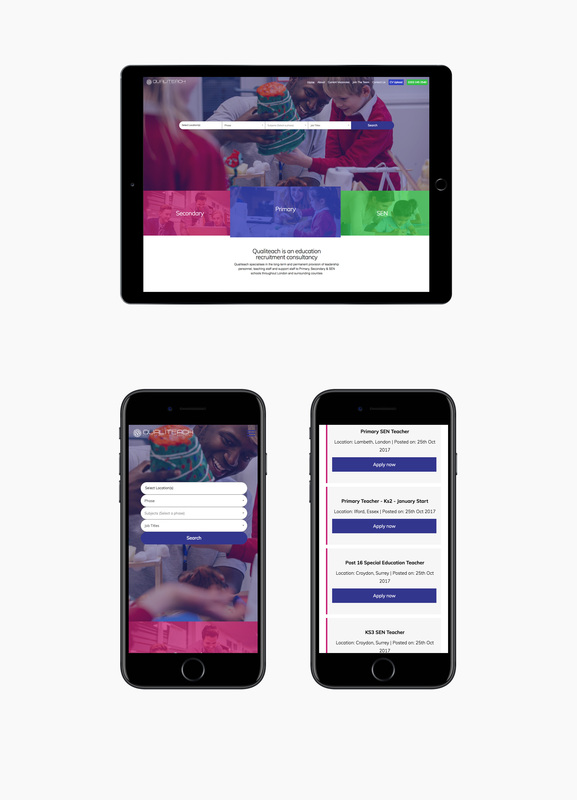 Through our discovery and research stage, we developed a colour pallet specifically for each schooling sector, enabling users to have a coherent experience with browsing the site. We developed a bespoke app for Qualiteach to enable the teachers that they place, to log the hours that they work in specific schools. By undertaking an analysis of the current processes in place, and converting the paper-based documentation to a digital platform, we were able to greatly increase the efficiency of Qualiteach's internal processes and communication processes with schools and teachers. Qualiteach uses a specific CRM to publish job posts to multiple platforms simultaneously. 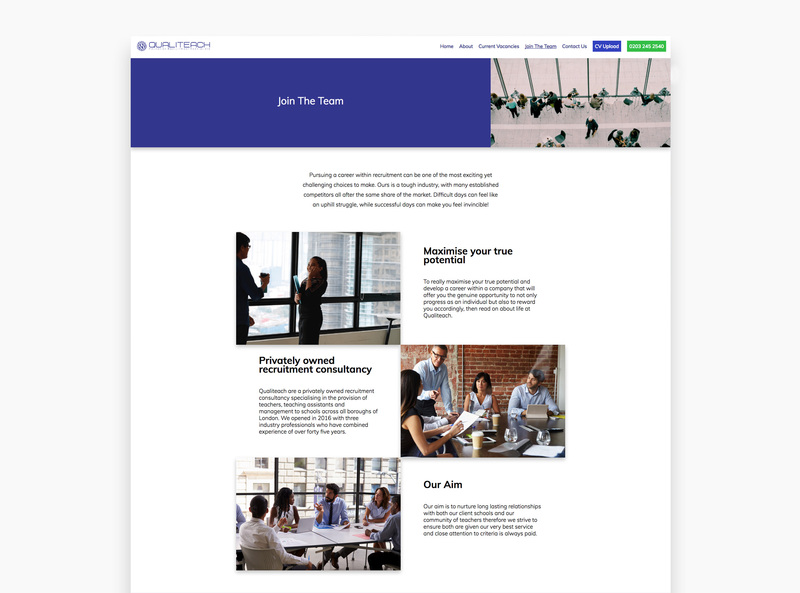 We created a platform that integrates comprehensively into their CRM, enabling jobs to be directly posted to their site and applications to be received directly into the CRM from the new site. 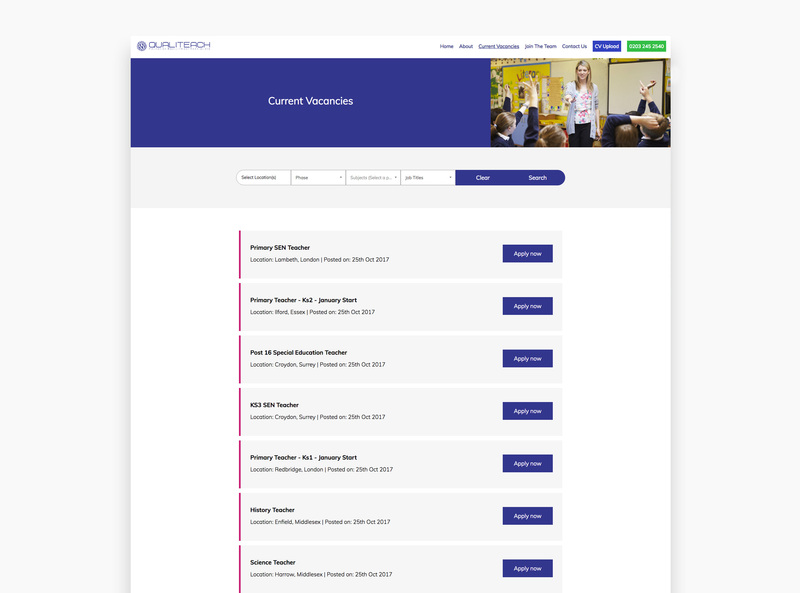 The integration enables teachers to search, filter, share and apply for job posts within one environment. Since going live, Qualiteach has seen a significant increase in the number of applications that they have had submitted by teaching applicants, with the number rising each day. As a result of this, they have also been able to create more relationships with schools and have had the capacity to expand their recruitment consultancy business.